1. Spiegel® and Newport News. Get an extra 40% off this weekend (until 01-15-2012). No promo code needed. No minimum purchase. 2. Hanes. Just in time to begin that New Year’s Resolution. Get 30% off sweats 2 days only (1-15-2012-1/16/2012). 3. QVC. Honora Pearls introduces a new color this weekend in pearls: Cinnamon. Red, not a dusty red, but a hot red. Hot color by the number of sales. 4. ideeli. Shopping Marathon this week. 50%-80%+ off selections. 5. couture candy. 22% off ends Sunday eve. Promo Code: 22Now. 6. Crocs™. Save up to 70% off Winter Sale ends 01/19/2012. Can’t find shoe size, check Shoebuy.com extra 25% off, use promo code: BDAY +Free Shipping. 7. Younkers. Yellow Dot Sale 70% off plus take extra 20%, use promo code: JANCLRNCE12. Semi-Annual Home Sale begins Wednesday8 , Jan.18-28, 2012. 8. Macy’s. Online extra 15% off plus sizes , even clearance. Use promo code: SUPER. 9. 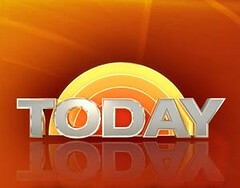 Jewelry Television®. Customer Appreciation Days. Bella Luce ® now at JTV. New offerings from Jewelry School and special buys. 10% off all clearance. $1.99 Shipping. Going to a state fair not only gives the fair-goer an opportunity to experience new deep fried food entries, famous celebs at the grandstand shows, special competition events, and farm animals, but also booths offering new products. Okay, some products are over-exposed product infomercials, however, a number allow a venue for local and innovative products. One new beauty product MarkdownMom especially liked was the Migi Nail Art™ Designer Nail Art Pens. This is an opportunity to discover that inner artist in you and create your very own unique fashion statement with your nails. Your nails are canvas on which you can create your own living works of art with an endless palette of colors. All the tools you need come in one kit for around $25. Looking Royal Without Blue Blood Prices! Lilly & Star. 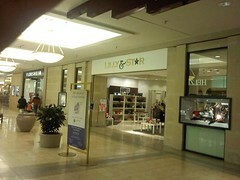 Fairly new store in the Rosedale Mall, Roseville, Minnesota. Selling the latest hot items from the Brits, this is their first store in U.S.
Fabulous leather handbags, trendy fashions, jewelry and accessories. Looking for those royal feather poofs for the hair? Find them here without the Phillip Treacy sticker shock prices. Herberger’s. Instore shop the Yellow Dot Sale and get up to 6o% off ! Online many items are 50% off, take additional 20% off use promo code: MAYONEDAY11. Oprah wants it and Beyoncé has it, and no matter what you call it,hair tinsel, hair glitz, or glam strand, it’s the newest hair trend for 2011. What it is are tiny, individual, colorful strands of sparkling tinsel that can be added by simply tying it in a knot to a couple strands of hair. It may also be added into hair extensions. Offered by Bella Via Hair Glitz (prices vary, $14.99 & up), Glam Strand, $6, and MarkdownMom’s favorite for selection and price, Hair Flairs, $10 pkg. of 100. The cosmetics manufacturers are turning out some remarkable products as you can tell from MarkdownMom’s recent posts. In the 70’s, models started experimenting with makeup especially eyes–some of us were ahead of the crowd and the difference was taking the time to read articles and experiment. Often you would get compliments, but back then a spectacular look depended upon not only cosmetics, but what facial beauty you came by naturally. Now with the advances by the cosmetic industry with user friendly products, everyone can enhance their advantages, diminish any conceived flaws, and attain not only a spectacular look, but a look that’s definitely yours. One thing remains a constant however, you have to find the time to perfect the application of cosmetics, and that means finding the time in our hectic schedule to practice, practice, practice! Now an innovative cosmetic company makes it possible to do that online. In the virtual reality of the internet, pürminerals® has an online Virtual Looks Program where you can click and drag their eyeshadow colors to see what works with your eye color. Plus sign-up for email and get updates on the latest trends, makeup tips, and special deals like free shipping on any purchase now until January 7, 2011. Combine colors, experiment and have fun–your new luck is just a click away. Sparkle Plenty is the name of the game for cosmetics this year as reported by GMA this morning. Naming the trend as “Glitter for Grownups”, expect lots of eyes and face cosmetics with glitter for the upcoming festive events. Hard Candy comes in once again with its’ Liar, a black cream with gold flecks. Corals and fuschia in matte are new colors for the new year, and fuller lashes by applying them individually at the outer corners of the eyes. Hard Candy is a brand once owned by Louis Vuitton Moet Hennessy and sold by Sephora. Its’ sister cosmetic line is Urban Decay. So with these credentials you expect quality, and you get it at its’ major distributor WalMart. With artsy colors galore, one would think that this is perfect for the younger set, but any age that likes to notch it up, will have fun with this line. 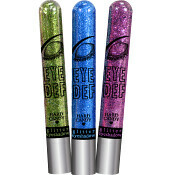 MarkdownMom found one of its newest offerings that combines hot colors with fiber to create those full, edgy eyes. 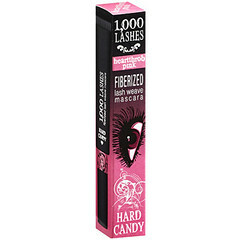 Hard Candy’s 1000 Lashes Fiber Mascara comes in Heart Throb Pink, Lush Green, Indigo Blue, Mermaid Teal, Purple, Brown, Black and Primer White. 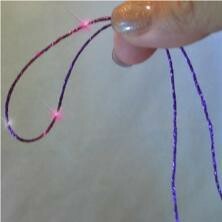 MarkdownMom recommends the lighter colors for impact like the teal, pink, green unless you have light eyelashes. Brush it on the tips of your lashes for a dual impact eye. Buy at WalMart for $6. 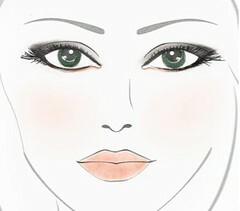 For New Year’s Eve Eyes!